But what about the actions of the Federal Reserve? Can they weaken the currency and continue the speculative fervor? In ‘Heroes and Villains’, we demonstrated that the Federal Reserve System relies on private banks to create money. Without new loans created, deflation takes hold, banks fail and asset prices return to their cash value. While M1 (deposits) has been sky-rocketing, the supply of money (M2 and M3 – larger deposits, money substitutes and repurchase agreements) that depends on a higher level of trust in the banking system has been falling. Deflation also has implications for a buy-and-hold investment strategy. Buying assets is usually necessary to stay ahead of inflation. (Inflation is the growth of money relative to goods which causes a rise in prices.) As we explained earlier, we currently do not have growth in money. The Consumer Price Index (CPI) chart below is showing the expected result. Without inflation there is no need to invest. “…a CNBC poll released yesterday showed that 90% of Wall Street economists believe the recession has ended.” – Gluskin Sheff chief economist David Rosenberg, Financial Times. 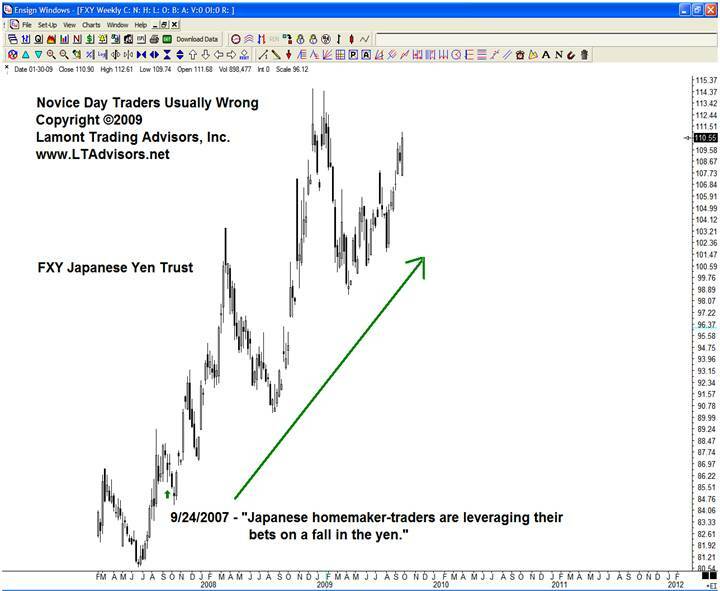 The peak of bear market rallies coincides with widespread bullish belief. Or simply put, at tops the market fools as many as possible into buying before it collapses. We have continually compared this financial crisis to the Great Depression in the build up and in the collapse. 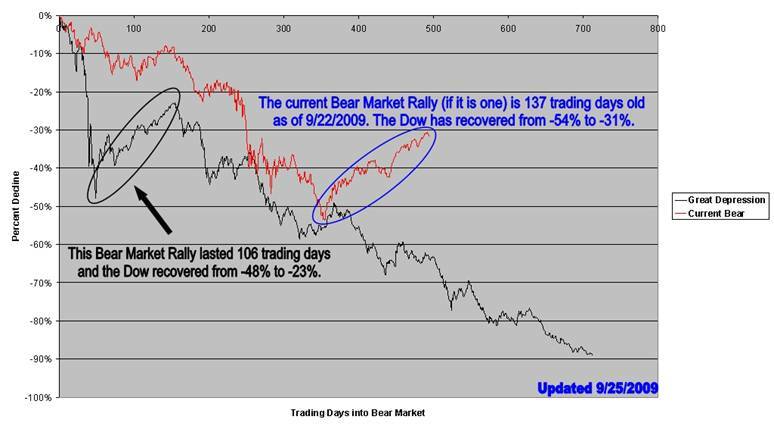 As you can see from the chart below, the recent rally is not out of the ordinary during a depression.